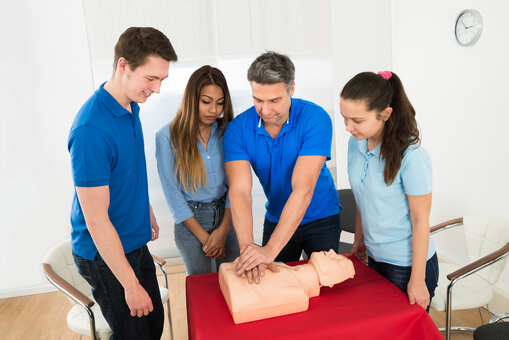 Learn a New Skill, Start First Aid Training Today! Are you wondering why you should bother to learn first aid? Accidents can happen anywhere. You could be out in the mall, or you could be driving to work, or you could even just be at home. No one can predict when an accident will happen or who will get caught in it. Your friend, your loved one, or even you could be injured and be in danger! How will you react in the face of an emergency? Being able to execute first aid at times like this can be more than just handy. It can help increase your survival and the people you care about. You can prevent further damage. It’s true that calling 911 is the best option when it comes to an emergency. But it will take some time before the first responders can arrive at the scene. In cases like stroke, heart attack or serious injury, the first few minutes are vital in stabilizing a patient. Delaying care could mean fatal danger for the person in trouble. But with first aid, an injured person will have better chances of recuperating. It’s not far from impossible. Just think about it, you could be in a crowd when suddenly someone feels ill or gets injured. Without someone to give them immediate first aid, their lives could be in danger. Sometimes the line between life and death only stretches by a couple of minutes. By learning first aid, you can make those minutes count. You can lead a safer life. One of the first few things you will learn once you start first aid training, is that you must first secure your own safety before anything else. You may think it’s being selfish, but it’s not. Just think about it. How are you supposed to help someone if you’re in danger too? First aid is about being practical. It teaches you to keep yourself in a safe position so you can better assist the people who need your help. This line of thinking will ultimately guide you through your daily activities, and in turn, allow you to lead a safer lifestyle. You can be more confident about yourself. When danger happens, a lot of people tend to panic. It’s a natural reaction. But if you had the chance to undergo first aid training, you will find yourself more composed than others. It may seem like a small thing, but being able to keep a cool head in times of emergency will help build your strength of character. It will boost your confidence levels too! Don’t pass up the chance to learn first aid and undergo Healthcare Training in Dolton, Illinois. Invite your friends and family to join you in first aid classes offered by Adonis College of Nursing, one of the excellent Nursing Schools in Illinois. Sign up today and learn a new skill! This entry was posted in Healthcare Training Center and tagged CNA / LPN program, First Aid Training, Healthcare Professionals, Nursing School. Bookmark the permalink. 4 Responses to Learn a New Skill, Start First Aid Training Today! I’m commenting to make you understand what a beneficial encounter my friend’s daughter gained browsing your site. She noticed several details, not to mention how it is like to possess an amazing giving character to let men and women effortlessly completely grasp selected complex matters. You truly surpassed her expectations. Many thanks for providing these essential, trustworthy, revealing and even unique tips about that topic to Lizeth. I must express appreciation to this writer just for bailing me out of such a crisis. As a result of scouting throughout the the net and obtaining things which were not pleasant, I assumed my life was done. Being alive without the presence of approaches to the difficulties you’ve resolved by way of your good short post is a crucial case, as well as ones that might have negatively damaged my entire career if I hadn’t noticed your web site. Your know-how and kindness in controlling all the things was vital. I’m not sure what I would have done if I hadn’t come upon such a step like this. I am able to at this point look forward to my future. Thanks a lot very much for your expert and results-oriented guide. I will not think twice to refer your web site to anyone who should receive support about this matter.